Every couple should know the joys of owning a self-inking return address stamp! Address stamps by PSA Essentials come in several very stylish designs, and they are perfect for addressing your wedding invitations. Not to mention, you will use your address stamp for years after the wedding. It's a celebration of your newly married status on every piece of correspondence. We also offer custom stamps with your name and/or monogram, so you can make any note card into your own personalized stationery! 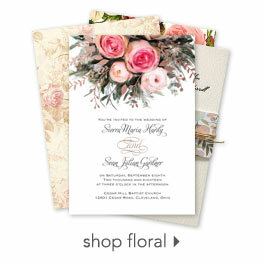 Looking for more ways to make your wedding invitation a beautiful part of the invitation ensemble? Check out our great selection of envelope seals for adding that perfect finishing touch.